Solution to your itchy feet. Spray for your pleasure! 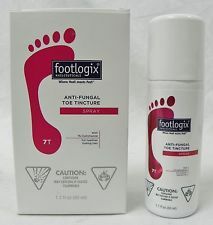 Footlogix ( Pamper Pamper Your Feet ) Fungus Killer Is Here! Now only SGD $36.90. Was selling at $65 in pedicure boutique. Hurry!! Solve your feet itchiness once and for all. Got all the complaints about foot skin peeling on the floor? Itchiness during a meeting but cannot scratch? Scared of removing your shoes at friends’ house cos they stink? Bleeding feet cos the need to scratch? Fret No More! Call 91515181 for the solution! Anti-Fungal Toe Tincture Spray A product designed to inhibit and prevent fungal infections under the nail. It has an easy to use applicator to allow product to get right under the nail to the problem areas. Is essential for the preventative care and protection of skin and nails prone to fungal attack. This tincture was developed for the prevention of nails prone to fungal infections. The unique spray system applicator allows for a hygienic application, and, therefore provides a great alternative to existing nail oils. It can easily be sprayed on nails, and contamination is avoided. Valuable active ingredients such as panthenol and avocado oil make chipped, rough and damaged nails look manicured and glossy again. The well-known, antifungal agent clotrimazole helps prevent the develpoment of nail fungal infections. Free of perfumes and preservatives. Dermatologically and clinically tested for skin compatibility. Recommended for preventative nail care also for diabetics. Also for people who spend a lot of time in wet areas (saunas, pools, changing rooms), as well as people who wear non-breathable (man-made plastic) footwear. Instructions: Contains a small tube applicator to get the product directly under the nail. Position the tuve under the nail and spray. Should be done under infected nail a minimum of once daily, but can be done more often if desired. Use as a treatment or as a preventative measure. Active ingredients: Contains 1% Clotrimazole, Panthenol and Avocado Oil.